Crimp bead, also know as French Crimp (which we will use interchangeably), is a small metal bead with thin walls and comparatively large holes. It is designed to be flattened with a crimp tool or crimping pliers. It is used to finish off wire or cord at the ends in lieu of unsightly knots and when used properly, give the jewelry a finished, professional look. These crimps are most often used with beading wire but it can also very effectively be used with strong threads. If you are cutting the length of wire you need ahead of time, allow at least 3-4 cm extra for the lengths you will need to attach the fastener to your jewelry piece using a french crimp. 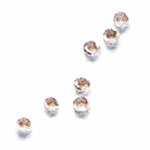 Use 2 french cimps if you are using heavy beads. 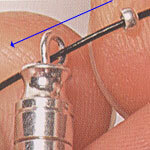 2) Then thread the wire back through the crimp, forming a small loop that allows movement but small enough to be neat. 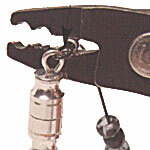 Flatten out your french crimp with a flat-nose plier or crimping pliers to firmly secure the crimp position. 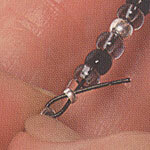 When you thread on your beads, slide them up towards your crimped end. Thread the left-over wire into the beads to hide it. 3) When you have finished stringing on all your beads to your specific design, thread another french crimp at the other end, and do the same as above and thread the spare end of the wire into the beads so as to hide it from sight.